Royal Green Acacia honey comes from the Robinia pseudoacacia and during the short flowering period in May and June, our bees collect nectar from the fragrant white flowers of up to 25 meters tall trees for a unique honey. Without doubt one of our most popular and sweetest honeys. This premium gourmet honey is sourced from the highest quality honey available in the world. Royal Green allows their bees to collect nectar in unspoiled areas all over the world. Our organic honey is not blended with cheap (blend) honey and is 100% pure, certified organic and from countries like Cuba, Mexico, Hungary, Germany and Portugal. We do not use pesticides and our bees feed off their own honey. It is cold-extracted, not filtered and you will taste the difference...enjoy! As much as you would normally. Below are reviews of Royal Green Organic Acacia Honey - 250g by bodykind customers. If you have tried this product we'd love to hear what you think so please leave a review. 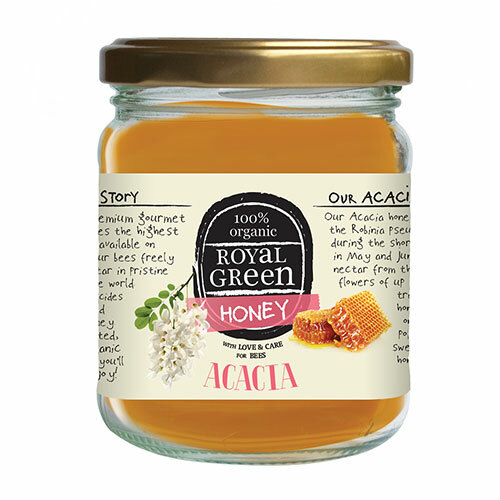 Royal Green Acacia honey comes from the Robinia pseudoacacia and during the short flowering period in May and June, our bees collect nectar from the fragrant white flowers of up to 25 meters tall trees for a unique honey.